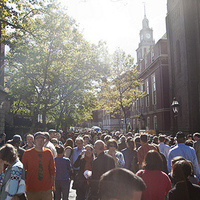 The RISD Alumni + Student Spring Art Sale takes place outdoors on Providence’s historic Benefit Street, between Waterman and Hopkins Streets. All artists participating in the sales are RISD alumni or current RISD students selling original artwork including prints, photographs, apparel, ceramics, glass, textiles, and more! The RISD Alumni + Student Art Sales exist to showcase alumni and student work, provide a testing ground for entrepreneurial efforts and new work, and to offer the local community a chance to interact with RISD work and artists/designers on a personal level.